Let’s face it – grout can be a real pain to deal with in a shower or tub area – but cheap plastic or fiberglass surrounds aren’t the answer because they just don’t last (and are prone to discoloration and cracking). 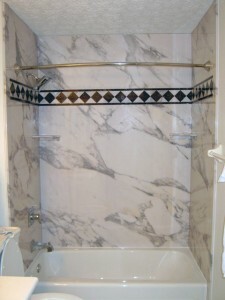 In addition tile walls can be problematic with mold and mildew. So what type of shower wall panels can create a cool low maintenance space for a DIY’er that’s easy to work with and won’t bust the budget? Learn about 3 interior wall systems below that can achieve this objective. System 1 – PVC Backed Composite Sentrel Walls – One of the most interesting new product on the market in the last 5 years is the decorative Sentrel tub and shower inserts. Sentrel is a PVC backed composite that fuses of an advanced high resolution digital image and a scratch resistant hard coat to create the look of real stone at a fraction of the price. This material is easy to install and comes with a range of accessories (including 2 different sized niches, corner shelves, trim moldings, and accent strips). This system can be used with any tub or shower on the market. It is ¼” thick and is easy to cut with a utility knife. 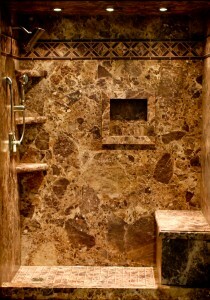 There are over 20 different stone patterns with a wide mix of luxury stone patterns. The most common panel sizes include 60 x 96, 36 x 96, 60 x 60 and 36 x 60. There are also ready to purchase DIY shower and tub kits that include precut walls and trim pieces for an even quicker installation. There are different sized trim moldings to accommodate a new construction or remodel installation (it is possible with this line to go over existing tile). The system uses a specialized polyurethane adhesive to adhere the DIY tub or shower wall panels over sheetrock or existing tile. System 2 – Acrylic walls – Acrylic shower and tub wall surrounds have come a long way since the days of the plain white walls that were originally used in hotels to go over old tile. There are now natural stone and tile patterns in acrylic. This material is thinner than the Sentrel (1/8” thick vs. ¼” thick) and can be a bit tougher to work with (especially on a cold day due to expansion and contraction). It is warm to the touch and is flexible in it’s ability to go over old tile shower and tub surrounds. The acrylic can be cut with a jig saw. One of the challenges with acrylic walls is they can be difficult to source as a DIY consumer and the colors are more limited than the Sentrel materials. 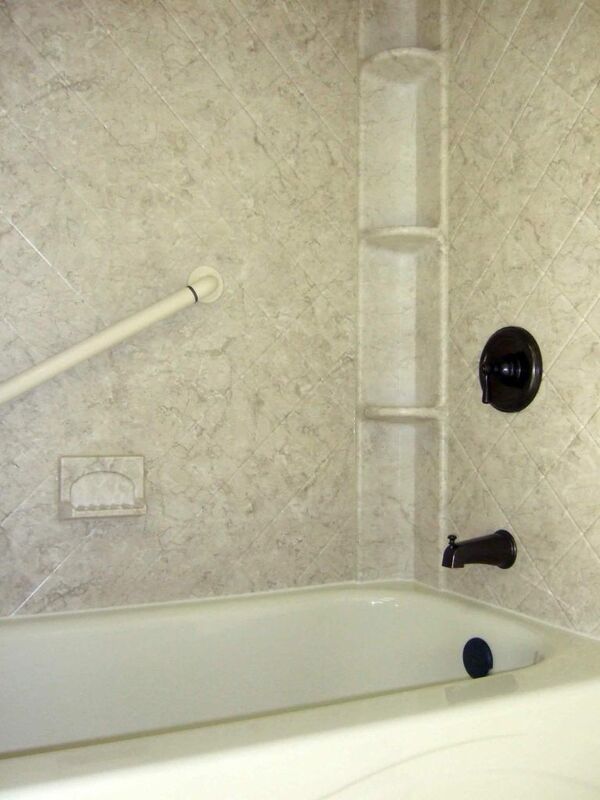 System 3 – Solid Surface Shower & Tub Surrounds – Solid surface panels are another option for a DIY’er. These panels come in different sizes for both standard or custom sizes in over 60 different colors. The panels range in size but many of them weigh approximately 50 to 60 lbs. per section (this can make them tougher to work with than the PVC backed composites or acrylic systems). Solid surface panels are usually cut with a circular saw with a fine blade (this may present a challenge for a DIY’er who does not own this type of equipment). What do you think of these 3 interior tub and shower wall panel systems? Have you used any of them or another system you’re like to provide input about? Please comment below. If you’re looking for more information or an estimate to install or supply the decorative Sentrel shower or tub wall panels contact The Bath Doctor of Cleveland (216-531-6085) or Columbus (614-252-7294).For nationwide direct product sales call Innovate Building Solutions (877-668-5888). For complete bathroom remodeling contact Cleveland Design & Remodeling (216-658-1270). This article was authored by Mike Foti. Mary – since we wholesale across the country we can supply you directly with these surround walls. Feel free to call us at 877-668-5888 – we’d love to help you! I would like to know where I can buy one of the surround walls in Los Angeles. Ken – we do offer corner shower caddies separately if you’d like. Give us a call. I have an existing shower and would like to add the corner shower caddy. Do you know anyone that sells just these items and colors available? Thanks for your inquiry. Our company can supply you these products on a wholesale basis. I will include a link here to check out these products – feel free to call us – we would love to help! I have a 6x8x9 foot shower to finish. Are there dealers in the Kansas City area?